How Do We Win the Fight Against the Right? During the last two years, Trump and the Republicans have attacked nearly every portion of the population imaginable: women, children, immigrants, people of color, LGBTQ folks, poor people, and the broader working class. Trump actively fueling racial division and nativist hatred of immigrants. A regime of ICE terror in immigrant communities and violation of the basic human rights of refugees by separating children from their families and holding them alone in detention centers. Kavanaugh’s potential appointment to the Supreme Court, a direct threat to women’s reproductive rights, LGBTQ people, and anyone resisting corporate power. Millions of Americans losing health care through Trump’s campaign to repeal Obamacare. The Republicans are determined to continue attacking Medicaid, Medicare, and Social Security, a massive assault on the poor, elderly, and working Americans generally. The relentless rolling back of environmental regulation which makes big business happy but worsens the threat of drastic climate change. The totally inadequate and racist response to Hurricane Maria in Puerto Rico which led to thousands of preventable deaths. The Supreme Court’s Janus decision, a direct attack on the public sector workers’ right to union representation. Massive tax cuts for the rich and removing restrictions on the banks which crashed the economy in 2008. And this is by no means a comprehensive list! As the policies of the Trump administration continue to affect people’s everyday lives, and the bulk of elected officials show no serious response or leadership, ordinary people have taken it upon themselves to call for mass actions to demand change. Since Trump was elected there have been mass occupation of airports against the Muslim Ban, Women’s Marches, anti-far right marches, student walkouts to protest rampant gun violence and the NRA, and “Keep Families Together” marches against the inhumane immigrant detention centers. Teachers rose up in state after state to fight vicious austerity imposed by (mostly) Republican state governments. Incredibly, in almost all cases the resistance in the streets has not been organized by the unions, traditional women’s and civil rights organizations, or other forces that are supposed to defend the interests of working people and the oppressed. People have certainly not been mobilized by the leadership of the Democratic Party which has capitulated to Trump on defending Dreamers and was prepared to give Kavanaugh a pass until brave women stood up. History shows us that when working people come together and fight, we can win: the 8-hour workday, the right to organize a union, women’s right to vote, ending Jim Crow, gay marriage, etc. 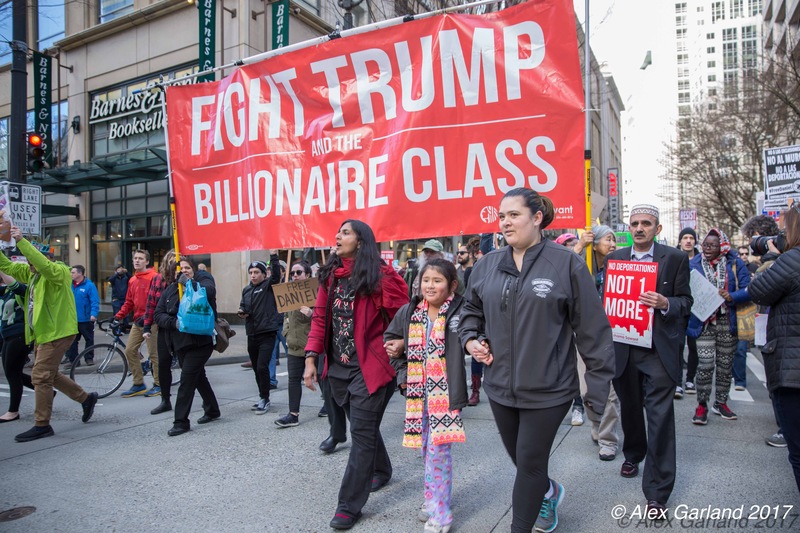 In order for movements to take on a sustained form and strike real blows against the billionaires and bigots like Trump, they need to be organized with democratic structures and a cohesive political program. This type of organization would point towards a new left political party, a party for working people, that would fight unapologetically to win things we desperately need! FIGHT FOR: impeaching Trump; a $15 living wage for all; rebuilding the nation’s infrastructure on a green basis and thereby creating millions of good paying union jobs; health care for all; affordable housing; and free education paid for by taxing the rich. DEMAND: candidates take no corporate money; accept the average wage of a worker if elected; and fight unapologetically for working people. HOLD ALL candidates accountable through elected democratic structures.